The origin of the cardboard album which holds Dorothy’s silk postcard collection is unknown. The date that it was made is not known either. Perhaps it was bought in the early 1900s, or perhaps at a later date when the owner wished to keep the cards protected from wear and tear. Dorothy may have purchased the album from a store, or maybe a family member bought it for her as a gift. This object was originally made to house photographs as can be seen from the embossed title on the front cover. It is made of heavy brown cardboard, the spine is bound with brown thread to match the colour of the cover and the leaves of the album. The condition of the album is very good. This sturdy photograph album has functioned very well as the object used to house these silk postcards which were sent to Dorothy Helen Facer. In August, Leanne blogged about some of the WW1 silks that we hold in the Ephemera Collections. Replicas of the silks in that post are still available to purchase at Sir George Grey Special Collections as well as the regional research centres. 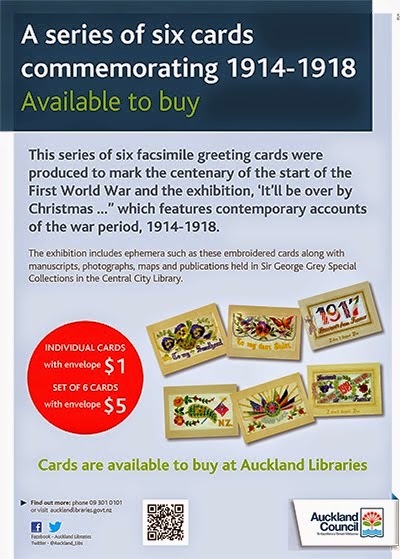 For more information on what else is happening at the South Auckland Research Centre do check out the Manukau Library and Research Centre’s Facebook page. Author: Sharon Smith, South Auckland Research Centre.